Some sad news to report today. Long time shooter Francis McNeil passed away suddenly on Wednesday, April 24. Our sincerest condolences goes out to the McNeil family. The Atlantic 1000 Purse is a go for 2019! 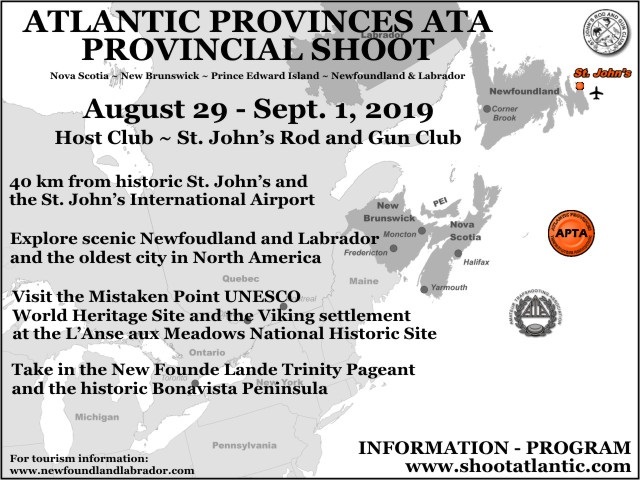 The 2019 Atlantic Provinces Trapshooting Championships will be held at the St. John's Rod and Gun Club August 29 - September 1, 2019. Please see the "APTA Shoot Info" Page for more information. The Atlantic Provinces Trapshooting Association and the Petitcodiac Sportsman's Club will be partnering for another gun lottery this year. This year's prize will be a Blaser F3 SuperTrap with a retail value of $12 000. Complete details will be released May 1. Stayed tuned for more details. 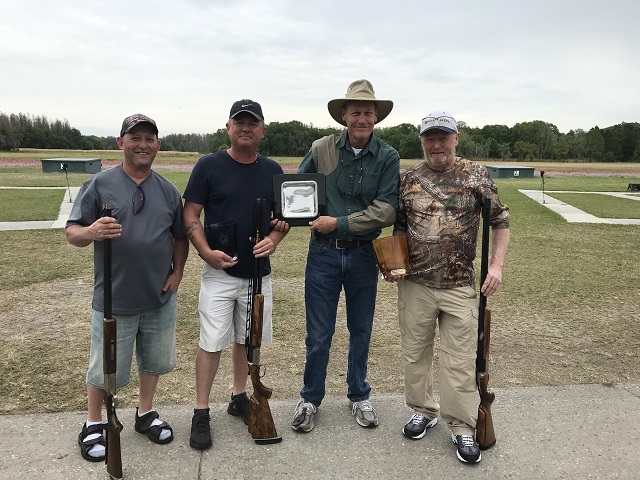 Congratulations to the 2018 Atlantic 1000 Target Purse winner Ken D'Eon who shoots out of the Highland Gun Club in Yarmouth, Nova Scitia. 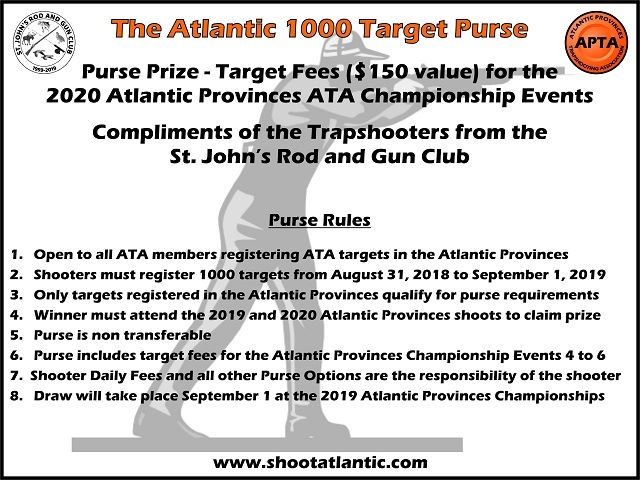 Ken will have his 2019 Atlantic Provinces ATA Provincial Shoot entry fees paid for compliments of the trapshooters at the St. John's Rod and Gun Club. The 2019 Atlantic 1000 Target Purse is a go for this year. For complete details visit our AP Shoot Info page.. 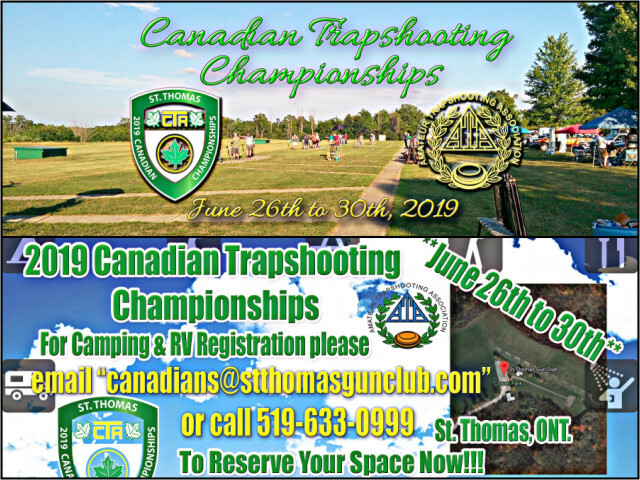 The St. Thomas Gun Club will be hosting the 2019 Canadian Trapshooting Championships. For a shoot information, shoot program and special hotel rates click 2019 Canadian Trapshooting Championships. 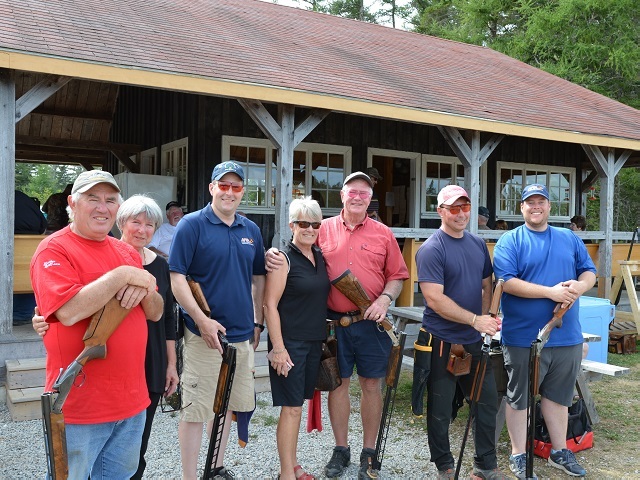 Welcome the Atlantic Provinces Trapshooting Association's (APTA) website - the source for all things related to trapshooting in the Atlantic Provinces. Here you will find our affiliated clubs, local club results, and information on our annual Atlantic Provinces Trapshooting Championships - sponsored by the Amateur Trapshooting Association. The Atlantic Provinces Trapshooting Championships is your opportunity to compete in Atlantic Canada's premier trapshooting competition and shoot against some of the best trap shooters in the Atlantic Provinces. 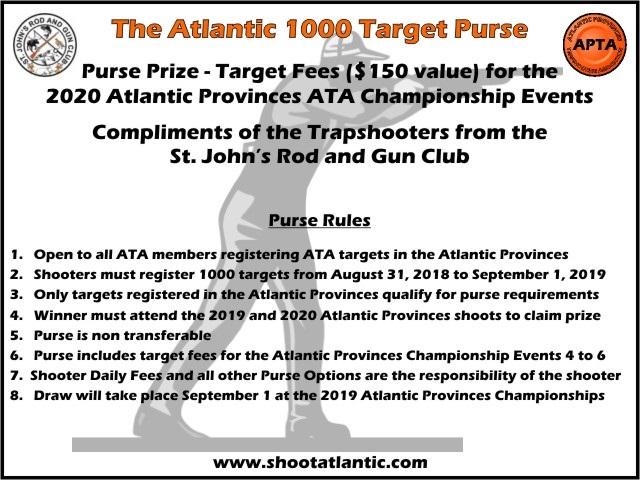 It does not matter whether you are an "AA" or "D" Class shooter, you’ll compete against shooters with similar averages and also get a chance to go shot for shot against the Atlantic Provinces Champions. 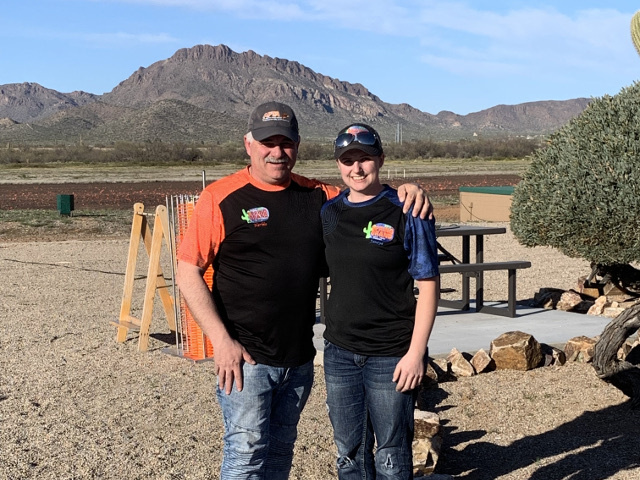 Start preparing for the Amateur Trapshooting Association (ATA) shooting season by organizing some ATA Registered Shoots at your home club. ATA Registered Shoots do not have to be large or elaborate with prizes or marathon targets – get in the competition mode by holding a registered target event during any of your regular shoot days. It does not require a lot of extra effort to organize an ATA Registered Shoot but the rewards will be evident in your scores. Registered League Shoot and Big 50s are other options to register targets. In addition to shooting good practice targets you need to shoot ATA competition targets to improve your game. Try it, you will be surprised at the level of confidence it will bring to your shooting. ATA Registered Shoot applications are available from the ATA (www.shootata.com) or from the APTA Executive. The normal procedure is to complete an application and forward it to the APTA, upon approval the ATA will forward all necessary forms and instructions to your club shortly afterwards. It’s a simple process that will have big rewards for your shooting. Why not give it a shot?